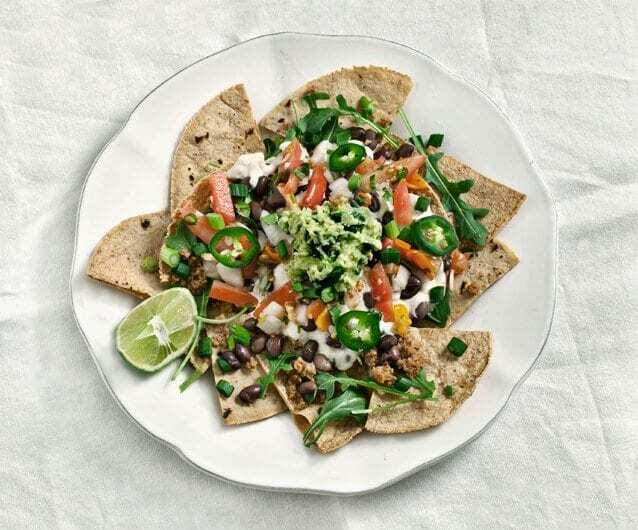 A hearty vegan & gluten free nacho recipe with TVP-based taco meat & cashew cheese. 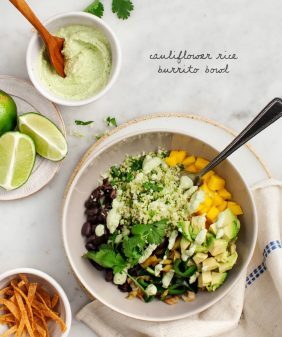 Topped with guacamole and pico, these are perfect for spring & summer. This recipe is from the Native Foods cookbook. Jack and I first stumbled upon Native Foods one night in California on our way back from Disneyland. I typically don’t eat foods at theme parks (I know, I’m “fun” like that), so after the fireworks we set out to drive around and find a restaurant. This was years before iphones and yelp, so it was nothing short of a Disney miracle that we aimlessly found ourselves at this awesome vegan restaurant. If you are new to the idea of nut cheese, it’s really nothing like cheese… but more of a cheese-like sauce (sans the yellow #4 food coloring). Feel free to put together your nachos however you like. I did black beans, pico, a quick guacamole, and “taco meat” made from soy granules. If fake meat isn’t your thing (I admit, I enjoy it occasionally), just leave it out and use what you like. 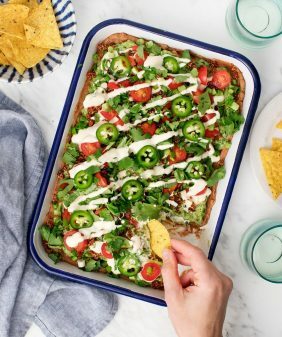 Vegan Nachos with Cashew "Cheese"
Preheat the oven to 400 degrees. 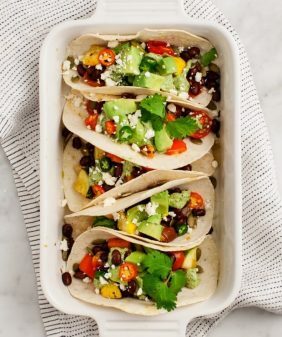 Slice the corn tortillas into quarters and spread them on a parchment-lined baking tray. Sprinkle with salt, drizzle with olive oil, and toast them in the oven until crispy. Alternatively, use tortilla chips. Make the cashew cheese: Soak the cashews in 1 cup water and set aside. Combine the agar and the remaining ¼ cup water in a saucepan and bring to a boil. Reduce the heat and simmer for 5 minutes, stirring continuously, until the mixture thickens. Put the cashews and soaking water, tahini, garlic powder, onion powder, and lemon juice in a blender and puree. Add the agar mixture and blend for 3-5 minutes until the mixture starts to thicken. 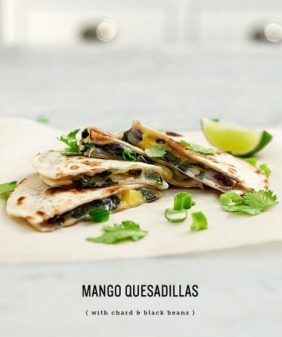 Salt to taste, and refrigerate the “cheese” while you assemble the rest of the nachos, allowing it to thicken while it rests. 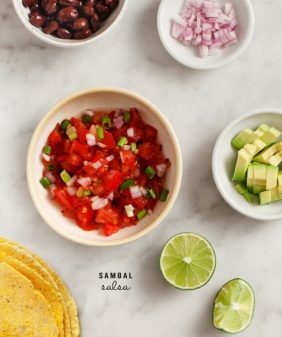 Make the taco "meat": Combine the TVP, ½ cup water, soy sauce, olive oil, cumin, coriander, garlic powder, and onion powder in a small saucepan and bring to a boil. Turn off the heat and let sit for 10 minutes. Make a quick guacamole by mashing the avocado with a squeeze of lime juice and a pinch of salt. In a small bowl, combine the chopped tomato, onion, cilantro, and jalapeño with a squeeze of lime to make a pico de gallo. Salt to taste. (Store-bought pico works here too.) Assemble the nachos with the corn tortillas, cashew cheese, taco meat, quick guacamole, pico, scallions, and black beans. Yes!! 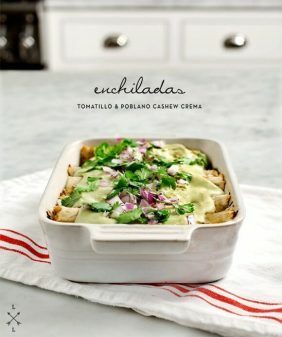 I am so excited to see this recipe. I am two weeks in on cutting out dairy and I am already trying to think of clever ways to get around it in some dishes! This looks amazing, thank you so much for sharing. I can’t wait to try it. perfect for sunday! love the cashew cheese.